Tending toddlers can require endless reserves of energy. 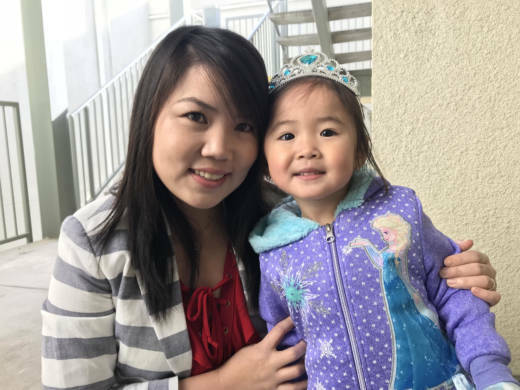 Just ask Huyen Le, supervisor of a family resource center in San Jose, California. After a full day’s work managing children’s reading programs and parenting workshops, she returns home to her own two-year-old daughter, Katelynn. “We do a lot in our center. Sometimes, I forget to do it with my kid at home,” Le says. Seeking inspiration, she turns to her phone where, for the last 10 months, she’s been receiving text messages with simple educational games, tips on how to engage with Katelynn and reminders of simple learning activities they can do together. The texts come from a team of researchers at Stanford University’s Center for Education Policy Analysis (CEPA) Labs. Each message goes out to parents or other caregivers and reminds them of the skills young children will eventually need for school and how to help kids build them. The approach is inspired in part by “nudge” techniques, that is, behavioral interventions that push a person during decision-making towards a certain goal. For example, many employers nudge you to save for retirement by contributing a portion of your paycheck to a 401k. You could always opt out, but making saving a default decision spares you the task of regularly choosing how much to put away – it lightens your cognitive load, so to speak. Nudges could have a powerful effect on education. Parental engagement can be a major factor in a student’s success or failure – and parents tend to have a lot on their minds. So several researchers are exploring how a simple text-based nudge to parents could improve their kids’ academic performance by making engagement easier and even habitual for parents. For instance, Peter Bergman, at Teachers College, Columbia University, found that in one West Virginia school district, simply keeping parents in the loop, through texting, as to their child’s absences and grades could cut course failures for middle and high school students by nearly 40 percent. (The Hechinger Report is an independently funded unit of Teachers College.) Reminders made monitoring a child easier, thus increasing the odds mom or dad would stay involved in a kid’s educational life. Texting, Bergman explains, while not the only communication option, is a wide-reaching, effective and inexpensive medium. The program Le participates in aims at parents of much younger children. Three times a week, researchers from CEPA Labs send parents and other caregivers suggestions on how to support children’s literacy, numeracy and social and emotional skills. Bath time, walks in the park and familiar household interactions become opportunities for children to learn and practice concepts they will later use in school. For example, a Monday message might flag an important domain (“children need to know the letters to learn how to read & write”); a Wednesday text might provide a related learning activity (such as asking a child to find the first letter in his or her name on signs or labels); and a Friday message might offer encouragement (“Keep pointing out the letters. You’re preparing your child 4 K [Kindergarten]!”). Results thus far are encouraging. In an analysis of 935 families with children in preschool in the San Francisco Unified School District, Loeb and her colleagues found that after eight months, teachers noted that text-receiving parents asked more questions about their child’s progress than other adults, and the kids themselves improved their literacy skills. “In the long run it tells us we can positively affect parenting, particularly for kids who have traditionally not been as well served,” says Stanford professor of education Susannah Loeb. In fact, language skills advanced most among kids who started the program with the lowest scores in a literacy assessment. These approaches work, explains University of Chicago professor Ariel Kalil, because they gradually reshape a parent’s routine and habits. Kalil, who co-directs the Behavioral Insights and Parenting Lab, has found that low-income parents know what they should do with their kids – such as reading more books or practicing counting – but fail to follow through as other parts of their life get in the way. “The issue is basically habit formation, you have a gap between wanting to do something and actually doing it,” she says. Along with the lab’s other co-director, University of Chicago professor Susan Mayer, Kalil is also exploring text-based nudges for low-income families. For instance, in a six-week study involving 169 parents, Kalil and Mayer gave families tablets preloaded with more than 500 children’s stories. Half of participating parents were asked to set weekly goals for how much time they would spend reading to kids, and then received texts with reminders of those targets, progress reports on meeting the aims and even notification when they spent the most time reading of any parent in the study in a given week. The other families received a tablet but no additional reading prompts. At the end of the intervention, the adults who had received the extra nudges spent more than twice as much time reading each week with their kids – a difference of 89 minutes on average. If all of this reminds you of FitBit, but for family time, you’re right. In fact, both Loeb and Kalil make that comparison. Regular reminders of your progress, tips to achieve goals and, yes, gentle social pressure are all nudges that fitness trackers use to not just get you moving but also make walking habitual. If your device breaks, perhaps you won’t make 10,000 steps a day, but you’ll have created a routine that makes it likely you’ll hit, say, 7,000. In that respect, the texting-based education interventions can also stick. Kalil and Mayer found that three months after their experiment had wrapped up and the tablets had been taken away, the parents who had received nudges were still spending twice as much time reading to their kids as the other families who participated. Building on those successes, Kalil and Mayer are exploring interventions aimed at parents’ math skills, math anxiety and improving preschool attendance. She herself likes having a record of activities to try with Katelynn. “It’s good to have it in the phone,” she says, where she can save a message for later if she can’t act on a tip right away. Given the many demands of parenthood, it can be nice to know that even when things become overwhelming someone will gently nudge you back on track.